With the deadline fast approaching to vote in the 2015 NSPS elections, only about 25% of NSPS members have cast a ballot. If you are among those who have not yet voted, and you have received from NSPS headquarters an email message containing a link to the online voting site, along with your unique voter ID number, please use that information to cast your vote by Monday, April 6. There is a fairly significant number of NSPS members for whom there is no email address in our database. A letter was sent to each of these members via the postal service when the balloting period began. Although many among that group have responded to request their voter ID number, many others have not. If you have not received an email message from NSPS containing the ballot, candidate bios (use the link by each candidate's name to view), and your voter ID, or if you have not received a letter from NSPS with instructions to contact our office, please do so right away so you will be able to cast your ballot. 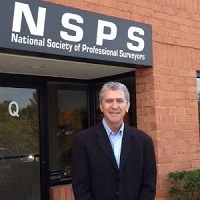 In continuation of adjusting the NSPS Bylaws to accommodate changes associated with the 100% joint membership program with the respective state surveying societies, NSPS members will vote on several such changes during the NSPS General Membership meeting to be held at 8 AM on April 16, 2015 in Arlington, VA, at the Hilton Crystal City Hotel. The attached file contains both the existing language and the proposed new Bylaws language for each affected item. The changes are primarily related to a change in the Area Director positions, and to a proposal to eliminate the current position of Secretary-Treasurer and create separate positions for Secretary and Treasurer. John L. Green PLS, Chairman of the West Virginia Society of Professional Surveyors (WVSPS) Legislative Committee, has reported that the organization is pleased to announce that a Statute of Limitations (actually a Statute of Repose) for boundary surveying in WV passed the Senate on February 25, the House on March 10, and was signed into law by Governor Tomblin on March 24, 2015. SB 489 will take effect on June 8, 2015. This law adds property surveying to the existing statute of repose covering planning, design, and surveying and construction of improvements to real property. Basically the new law says that no action to recover damages for any deficiency in the surveying of real property may be brought more than ten (10) years after the performance of the survey. Green says, "This is a huge deal for WV surveyors, WVSPS members and non-members alike. 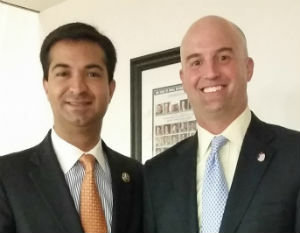 It represents the most significant legislative accomplishment we have achieved in many years; and one we have pursued for as long as I can remember." He went on to say, "I'd like to extend my sincere thanks to all those who had a hand in this effort. To Senator Mitch Carmichael for sponsoring the bill; Senator David Sypolt for covering our back while we were all at the convention by testifying before the Senate Judiciary Committee (which really started this bill rolling), and advocating for its passage in the Senate; our government relations consultant and lobbyist for all their hard work behind the scenes; Curt Sumner and NSPS for their informational help and support which was very important; our new executive director and administrative staff for their effective handling of critical communications; and all of you who promptly answered my alerts and calls to contact your representatives in support of this legislation. This accomplishment demonstrates what we can achieve when we work together with a unified voice. I ask that you all take a few minutes to reflect on this. Think what this means to you, your profession, and your business. This is truly what the WVSPS is all about. Kelly Ness PLS (Principal Instructor in the Surveying and Civil Engineering Technology program at Dunwoody College of Technology in Minneapolis) reports that after studying Greek astronomer Eratosthenes’ methods to calculate the circumference of the earth, his students in the Geodetic & Controls Surveys class recreated the process using ancient (276 BC) methods, and modern technology. Brian Portwood, is a licensed professional land surveyor who has been recognized as a leader in the advanced education of professionals working in the land rights industry. Early in 2014, the problematic nature of railroad right-of-way (RR R/W) from a title perspective was vividly displayed in the case of Brandt Revocable Trust v United States (US) (134 S. Ct. 1257) and the potential impact of that decision upon certain very popular yet highly controversial surface uses of former RR R/W has been well documented. In reaching the High Court, the Brandt case focused the attention of land rights professionals around the nation upon the fate of RR R/W that is no longer in use for its originally intended purpose, which of course is not an uncommon scenario, since extensive railroad abandonment has occurred in recent decades. Near the close of 2014 however, the California Court of Appeals (CCOA) addressed another case involving RR R/W, which appears to be well positioned to unleash an even more powerful legal shock wave, with truly enormous consequences for participants in the utility industry, as this time the controversy relates to subsurface land use of both former RR R/W and currently active RR R/W. While both the Brandt case and the one reviewed herein are, at their core, controversies implicating title to land, this latter battle, which is now awaiting attention from the California Supreme Court, could ultimately produce the most explicit and detailed clarification of the legal status of vast portions of the existing network of RR R/W traversing the American West that has ever been handed down. NSPS is excited about its upcoming joint conference with MAPPS, and wants to share the experience with its members, and others, who cannot attend. In order to do that, NSPS is teaming with GeoLearn to share the experience using social media outlets Facebook, Twitter (and perhaps LinkedIn posts), as well as posting conference highlights of the YouTube channel. There will be "man (or woman) on the street" interviews with presenters, attendees, exhibitors, etc., anything that seems to be newsworthy. Join host Curt Sumner and Joe Paiva (GeoLearn) for a conversation about the upcoming broadcasts, and an overview of the benefits social media can bring to any organization, or business. If you are unable to listen to the show when it is being broadcast, listen to the archive of the show at http://www.radiosandysprings.com/showpages/ACSM.php. Archives for each show are typically available for listening within a few days after the show airs. The lineup of speakers for the NSPS-MAPPS conference continues to grow, with several sessions, presentations and key government officials now confirmed. A program of presentations on current business, technical and professional issues has been announced. Additionally, NSPS and MAPPS is pleased to announce that Jim Williams, manager of UAS operations at the Federal Aviation Administration (FAA), will be the keynote luncheon speaker on Tuesday, April 14. The NSPS-MAPPS day on Capitol Hill will start with a Congressional breakfast featuring Rep. Paul Gosar (R-AZ). Full registration for the conference is required for attendance at these events. Moreover, members of the new Jefferson Club of the NSPS PAC will hear U.S. Senator Cory Gardner (R-CO). The NSPS Political Action Committee (PAC) has created the "Jefferson Club," a group of committed and dedicated NSPS members who contribute $500 per year to the NSPS PAC. Jefferson Club members are provided special benefits, including free admission (PAC contributor and spouse) to a special dinner on Tuesday, April 14 in at the Capitol Hill Club in Washington, DC, during the NSPS-MAPPS joint conference. That event will also include members of the MAPPS PAC "Inner Circle" and other special guests from Congress to be announced. To join the Jefferson Club, please complete the online form. On that form, indicate "PAC Fund" on the drop-down menu for "Fund:" and contribute $500 or more, or, send a personal check (payable to NSPS PAC) or credit card information or call the NSPS headquarters office, NSPS, 5119 Pegasus Court, Suite Q, Frederick, MD 21704, phone: 240-439-4615. Pledges for installment contributions will be accepted. Admission to the PAC dinner is separate from conference registration. One of the most revolutionary technologies ever to be introduced to the surveying and mapping profession is unmanned aerial vehicles (UAV) or unmanned aircraft systems (UAS). The NSPS-MAPPS conference will feature several activities to inform surveyors of information needed to enter this exciting new line of business, including technical and business requirements, as well as law and regulations. This includes a session on "What You Need to Know Before Starting Up Your Unmanned Aircraft System (UAS) Department" by Bryan Baker of Leica, and a keynote address by Jim Williams, manager of the UAS office of the Federal Aviation Administration. Full conference registration is required to attend these events. To register, click here. Meanwhile FAA has announced a streamlined process for airspace authorizations for section 333 exemption holders, while enforcement and "grounding" of unauthorized commercial UAS operators has increased. Who's doing what in 3-D surveying? Where does BYOD fit in for field data collection?